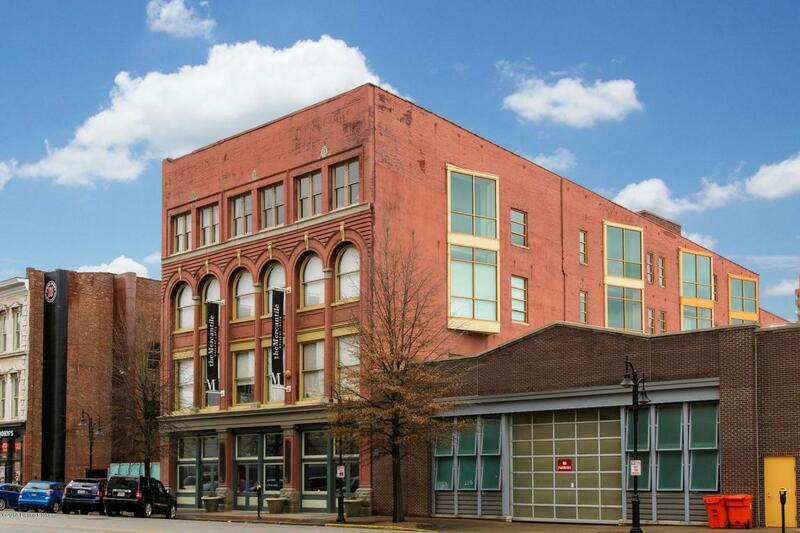 All the Charm and Character of Downtown is found at 309 E Market Street #206 in the Mercantile Lofts! This gorgeous, Second Floor, 2 bedroom 2 full bathroom condo is centrally located to all of the wonderful amenities of Downtown! Fall in Love with the soaring ceilings throughout, exposed wood beams, exposed brick, stained concrete floors, fantastic views and much more. The eat-in kitchen offers stainless steel appliances, granite counter-tops, and an abundance of counter and cabinet space. Both bedrooms offer en-suite bathrooms and walk-in closets. This unit also features a nice sized laundry room. One Off-Street parking spot in the garage is also included.You will want to check out the common areas that Mercantile Lofts has to offer including a fitness room, library, community kitchen, sitting area with fireplace and - list goes on! This building also features plenty of security and an elevator. Don't miss out on this great opportunity! Schedule your private showing of 309 E Market Street #206 today!